Applicability: Any house with a concrete slab in basement or a house built on a slab foundation where the source of radon is coming from below the house; which is generally the case in all houses with elevated radon levels. Principle of Operation: A negative pressure field is created below the slab preventing the entry of radon gas into house. System Description: A hole is drilled in the slab and a small pit is created beneath the penetration. PVC pipe is placed in the hole and routed unobtrusively as possible usually through closets, plumbing chases or other unexposed areas to the suction side of the fan (typically installed in the attic). PVC pipe is then connected to the pressure side of the fan and routed through the roof using standard plumbing vent pipe roof flashing. The radon gas is discharged safely through the PVC vent pipe which protrudes above the roof. This will have the same appearance as a standard plumbing vent pipe. On an exterior application, the PVC pipe exits to the outside above foundation wall and all components are exposed at exterior of wall. 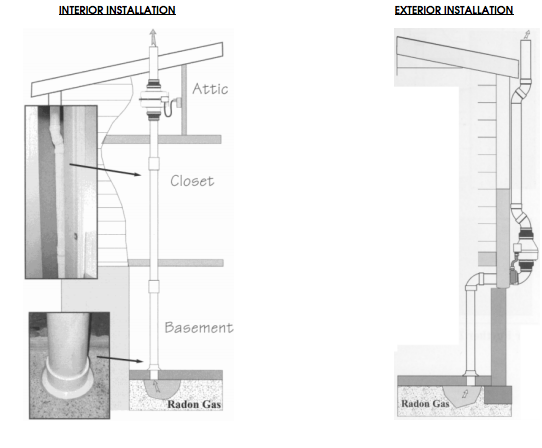 PVC vent pipe extends above the roof eave as shown in the illustration at the right.